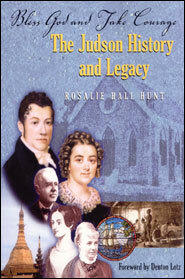 A daughter of missionaries herself, author Rosalie Hunt (who served in 8 different Asian countries herself) has extensively researched the Judson family and took the time to walk in the cities and nation where they served. The result is, an utterly fascinating saga which anyone – whether interested in missionaries or not! – will find a real page-turner. Adventure, affliction, war, zeal, tragedy, and triumphthis was life for America’ first missionaries. 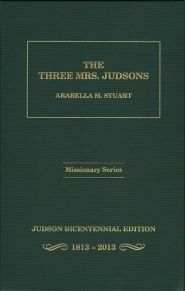 Rosalie Hall Hunt has provided a well-researched, thorough, and scholarly account of Adoniram, of the three womenAnn, Sarah, and Emilywho served as his partners in life and mission, of the Judson descendants, and of the lasting impact of the Judson ministry. 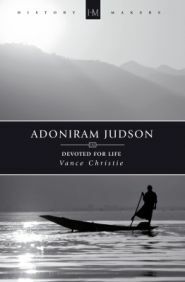 An engaging and in-depth tale of the people whose vocation led to the birth of American missions, Bless God and Take Courage documents the life and legacy of the Judsons with never-before-published discoveries and details. 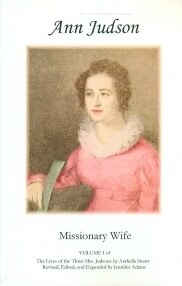 Rosalie Hall Hunt is a passionate student of history, focusing on the lives of leading women who have shaped missions. A frequent speaker at churches and conventions, Hunt brings Baptist history alive, speaking on remarkable figures from the past. She also inspires with her dramatic monologues of Lottie Moon, Hephzibah Jenkins Townsend, Kathleen Mallory, and Ann Judson. The daughter of missionaries to China, she and her husband Bob served for 30 years as missionaries in eight Asian countries. These include China, Hong Kong, Taiwan and Myanmar.